A kit I finished last year, full hull Revell 1/700 offering with Eduard's PE and barrel barrels from Aber. Rigging Modelkasten wire. File comment: My model (top) vs one of the best ones I know and it was my inspiration really for building the 1/700 scale (Peter's is 1/350). The pic lowest is the reference I used for painting from a Asmussen and Leon book. File comment: some between stages, phone camera shots. File comment: When it was WIP few years ago. Last edited by pascalemod on Fri Jan 18, 2019 2:42 am, edited 1 time in total. Really nice! A lot of times PE railing looks overscale in 1/700 to my eyes but yours don’t stand out to much and look about right! Well done! Thanks, the railings were from Eduard and were quite fine. On Mikasa build I actually gave railing a black wash, and then wiped off the excess. It made them visiually even thinner, so I might repeat this on future builds. Took me awhile for my research to come up with the ships camo pattern being partially painted over after He left port. I see you were way ahead and got the camo right. Well done. Your detail and accurate work is to be commended as previous members have mentioned. Nice job on the rear "open" rangefinders too. I found that WEM's railings seem to be some of the finest around. Thanks for this! I am not even sure what you mean about open range finders, on turrets you mean? This is PE indeed. I have much info it, if you have questions that might aid you in research shoot away. If you want the battle ready ship, as I made you wanna fold railings on main deck. I didnt fold railings only because I like to show them as is. 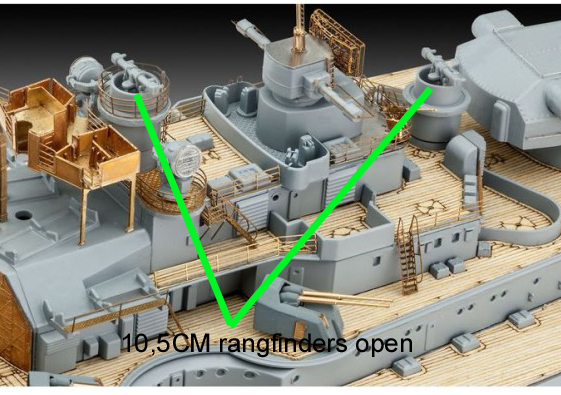 However if I build Prinz Eugen I will fold the railings. Bismarck put to sea before all the work was done. The aft AA Rangefinders never got their Covering. You and Revell got this correct. 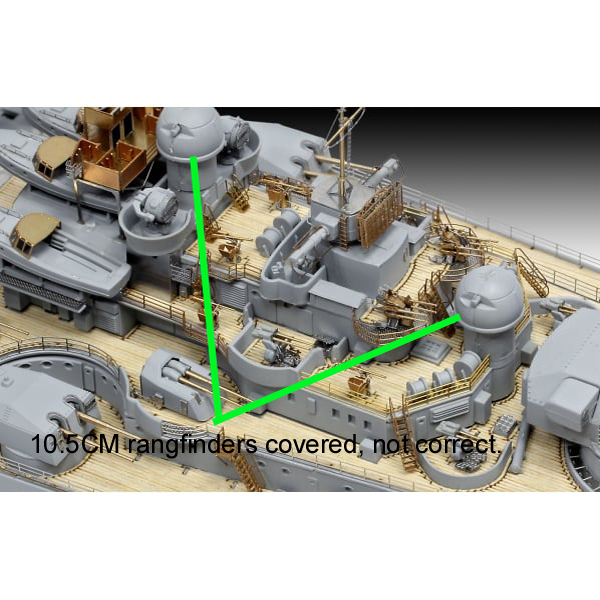 Many Bismarck model kits have this wrong. Here is some of that Eduard PE and shots of the rangefinders, "with and without". Very cool, thanks for pointing it out. I knew Revell's kit was much better than people realised. Considering to do their Tirpitz too one day.